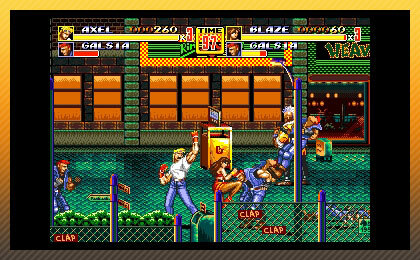 From the amazing Yuzo Koshiro soundtrack to the solid gameplay, 3D Streets of Rage 2 is definitely one to pick-up. If there’s one genre that’s incredibly well-represented on SEGA’s 16-bit powerhouse, it’s beat ’em ups. I mean when you consider games like Golden Axe, Battletoads and Double Dragon, and Captain America and the Avengers, you’ll get an idea that the Genesis had beat ’em ups down pat. However, the Streets of Rage series hooked me like no other. From the first moment I played the first game, I was enthralled with cleaning up the mean streets of Mr. X’s henchmen. With the recent release of 3D Streets of Rage 2, you can only imagine that I went a bit crazy with excitement to get the opportunity to play this classic again, complete with all the new bells and whistles M2 is known for. As much as the entire trilogy has been ported to almost every console to man, it’s nice to have the first two entries in the series in a portable collection with other SEGA console and arcade greats. Once 3D Streets of Rage came out, I knew at some point they would be porting the second fantastic title. The influence Streets of Rage 2 left alone shows it’s one of the most important beat ’em ups for the Genesis. Released on July 23rd, 3D Streets of Rage 2 finally made its way onto the 3DS. At its core, it’s a simple port of the Genesis game we all know and love, but add in those M2 extras, and it quickly becomes the most worthwhile $5.99 you’ll ever spend. Where Streets of Rage 2 shines is in its pure simplicity. You take Axel Stone, Blaze Fielding, Max Thunder and Eddie “Skate” Hunter (Adam’s younger brother) through several stages of beating up every bad guy who gets in your way on your mission to save a kidnapped Adam from Mr. X. It’s kind of amazing that such a simple formula with tight gameplay and an awesome soundtrack can combine to make one of the best games in the 16-bit era, right? Like its gameplay, Streets 2’s button layout is pretty simple. Attacks, jumps and a special move is mapped to each of the Genesis’ face buttons. The specials are where this game kind of breaks away from the pack. There are three types of specials per character: a standing special, directional and a blitz attack, which is done by double tapping the D-pad forward and hitting the attack button. It’s a bit of a bummer the police back-up special from the original game is gone, though. Believe it or not, 3D Streets 2 looks as good as ever, and the level of detail and animation is definitely a step up from the first game entirely. The backgrounds and sprites have more color, and it’s even more noticeable on the 3DS’ screen, complete with the same graphical options as the other 3D Classics, the CRT filter and all. The 3D doesn’t look half bad either. Now I wouldn’t be a SEGA Nerd if I didn’t discuss Streets of Rage’s awesome sound design, would I? This game has one of, if not the best soundtracks to come out of a Genesis, and some awesome sound design too. Composed by Yuzo Koshiro, Streets of Rage 2’s soundtrack will always be remembered by SEGA Nerds as a defining moment in the Genesis’ life. There are just so many good tracks here, my favorites being Dreamer and Slow Moon. The audio and sound effects are damn good too, with just the right amount of punch, and some voices thrown in too. All in all, it’s a great package. Words cannot describe how awesome this OST is. Now let’s get to those M2 extras. There is a lot that change up the gameplay here. The first main extra is the Rage Relay mode. This makes it so that you cycle through all four characters while playing through the game. Once you lose a life as one, you switch to the others (Think Double Dragon 3’s “Extra Guys” function) in any order. This is pretty cool, as it helps to get used to characters you’ve never played. There are also three different gameplay types, Normal (the basic game), Casual (lets you take out any enemy by a throw or jump-kick) and Fists of Death mode (lets you KO enemies with a single hit). These gameplay types really help if you want to get used to the game and run through it like it’s nothing. The Round Select is also there, and is a welcome addition if a particular stage is giving you trouble and you want to skip ahead. M2 really made this game simplified for people who’ve never played the game before, which is a good thing. Local multiplayer mode is here too, for anyone who wants to beat some thugs with a buddy (keep in mind, you both need to purchase the game on each 3DS). Also returning is the sound board select (between the Genesis Model 1/2) and the choice of region, which is a little special in Streets 2’s case. 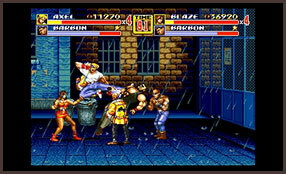 All in all, 3D Streets of Rage 2 is easily worth the 599 pennies it costs to purchase. 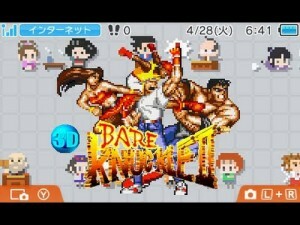 If you want a damn good beat ’em up for the 3DS, and one that will keep you playing for a while, it’s worth a shot. With all the extras on display here, this is the perfect way to release a game like this on a handheld. From the amazing Yuzo Koshiro soundtrack to the solid gameplay, 3D Streets of Rage 2 is definitely one to pick-up, especially if you loved the first game.